She wondered how much she should reveal. Her history was painful, and rehashing it for a stranger wouldn’t really help. “It’s complicated, but I know he wouldn’t not show.”“Not unless something stopped him?” Damon asked, finishing her thought. “Something or someone.” As she spoke, they rounded a bend and the road tapered downwards. In the distance she could see a cluster of buildings dotted with patches of open fields and circled by forests. Night Town. The sight of it sent a ripple of gooseflesh running up her arms. “You think he’s down there somewhere?” Damon had turned in his seat and was studying her as if searching her reaction. When your younger brother, the one you spent a few years raising yourself after your parents' death, goes missing -- you throw caution to the wind to go find him. Especially if you're a gutsy crime reporter like Lucy. She heads of into a part of the country she's not familiar with, into a town she'd never heard of, to find out what happened to her brother in the week since she'd heard from him last. Along the way, she comes across a helpful stranger -- a drifter of sorts, like her brother -- who is willing to lend a hand to the search. Lucy doesn't care (much) why he's willing to help, she's just glad someone is taking her seriously. When she gets to Night Town (such a friendly, welcoming name, isn't it? ), she's met with general apathy toward her plight -- and maybe a trace of antagonism. It's tough to say why people are so resistant to helping her -- maybe because she's a stranger, maybe they don't like drifters, Lucy could come up with a dozen reasons, but that wouldn't change things. None of the local residents seem inclined to help. It's a good thing she's found Damon. One of the men at the local police station seems indifferent (at best) to her problem, but the Senior Sergeant is eager to take a report and do what he can to find her brother. Now, as is the norm for small fictional towns that outsiders find trouble in, there's one family that owns about half the town, and employs the other half. Samuel Nightmesser is the only living representative of that family at the moment, so Lucy and Damon look into him (lacking any other ideas, hoping they'll come to them), while Senior Sergeant Day investigates in a more official capacity. We don't see much of the official investigation, but it's reassuring to know that not everyone in town is necessarily in Nightmesser's pocket. It soon becomes evident that there's more afoot than a missing drifter, and that someone in town is prepared and willing to take steps to dissuade Lucy from turning over any more rocks to see what's underneath. The reader knows a bit more than Lucy, and learns pretty quickly that there's more to some of the people in her life than meets the eye. From there, it's just a matter of Lucy and her associates putting the pieces together, uncovering all that's afoot and trying to survive -- and maybe help her brother to survive, too. It didn't take me long to write in my notes that "this is going to get creepy soon." It did. I also noted "this is going to have an ugly end." It did, and not necessarily in the way I expected. I also guessed right about a couple of identities. I think most readers will guess these things around the same point I did. Doing this doesn't make any of the reveals or the novel less effective. If anything, it helped build the tension, because you were waiting for particular shoes to fall. I should also add, that there were at least three reveals and twists that I didn't see coming, and one of them took me completely by surprise. The morbid and creepifying elements of this book are really well done -- I'd have liked to seen a bit more of them, honestly (and I don't typically need a lot of that -- but it would've helped, I think). Willet has a gift for using that kind of thing to reveal character, not just to advance the plot. I should probably note there's at least one sentence toward the end of the novel that you should probably not be eating anything while you read. Just a friendly tip -- set aside your snacks during the last 20 percent of the book. The action is fast, the book grabs your attention and keeps it throughout -- there's not a lull in the action and there's nothing dull within a mile of the text. It's a quick read (perhaps, too quick) and one that'll keep you entertained. 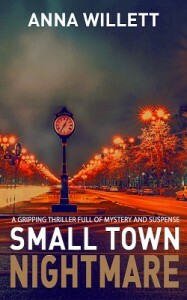 I want to stress that I enjoyed Small Town Nightmare, and my guess is that I'm not alone in this. However, it felt rushed. It felt undercooked. If things -- details, tension, mystery, relationships, etc. -- had been given a little more time to develop and grow; if threads hadn't been left dangling (or had been cut entirely); if motivations were clearer; I can easily see myself excited about recommending it. But, I can't do that -- I can recommend it, and I do think most of my readers will like it. I'm just not over the moon about it. My thanks to damppebbles blog tours for the invitation to participate in this tour and the materials they provided, which did not influence my opinion, merely gave me something upon which to opine.